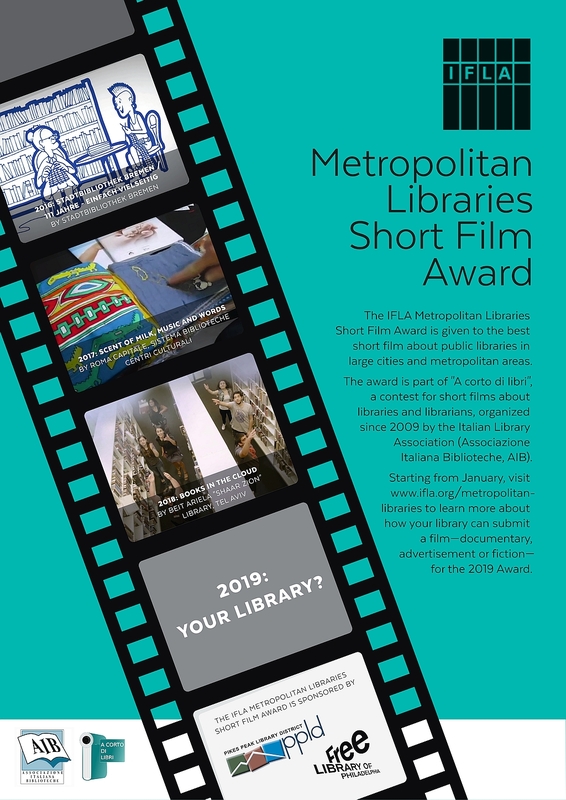 DI TILLIO, Corrado (2018) IFLA Metropolitan Libraries Short Film Award. Paper presented at: IFLA WLIC 2018 – Kuala Lumpur, Malaysia – Transform Libraries, Transform Societies in Session 153 - Poster Session. The IFLA Metropolitan Libraries Short Film Award is given to the best short film about public libraries in large cities and metropolitan areas. The award is part of “A Corto di Libri”, a contest for short films about libraries and librarians, organized since 2009 by the Italian Library Association (Associazione Italiana Biblioteche, AIB). The award was given to the public libraries in Bremen (2016), Rome (2017) and Tel Aviv (2018), thanks to a generous sponsorship by the Free Library of Philadelphia and Pikes Peak Library District. Every public library in a metropolitan area is invite to submit a video (documentary, advertisement or fiction) for the 2019 award. Starting from January 2019, visit http://www.ifla.org/metropolitan-libraries to learn more.